Kyrgyzstan's parliament voted Thursday to close a key U.S. air base in the country - a move that could hamper President Obama's efforts to increase the number of U.S. forces in Afghanistan. Deputies voted 78-1 for the government-backed bill to cancel the lease agreement on the Manas air base, a transit point for 15,000 troops and 500 tons of cargo each month to and from Afghanistan. Two deputies abstained. "The decision to shut the American base reflects the will of the Kyrgyz people," said Nurbyubyu Kerimova, a deputy with the pro-government party that overwhelmingly dominates parliament in the former Soviet bloc nation. However, Communist deputy Ishak Masaliyev said the decision on Manas could help improve ties between Kyrgyzstan and Russia. "We in Kyrgyzstan do not need anybody else's base. We have always advocated a union with Russia," Masaliyev said. Moscow's perceived pressure on Kyrgyzstan to expel U.S. forces has been greeted with frustration in Washington. "I think that the Russians are trying to have it both ways with respect to Afghanistan in terms of Manas," U.S. Defense Secretary Robert Gates said Thursday. "On one hand you're making positive noises about working with us in Afghanistan and on the other hand you're working against us in terms of that airfield which is clearly important to us." In late 2006, a U.S. serviceman fatally shot truck driver Alexander Ivanov during a routine security check. U.S. officials said Ivanov threatened the serviceman with a knife. "So far, no American soldier has appeared in court," Kyrgyz Foreign Minister Kadyrbek Sarbayev told deputies Thursday. Manas base spokesman Maj. Damien Pickart rejected the suggestion and said the U.S. had conducted repair work on the Tu-154, which also doubled as the president's private jet. 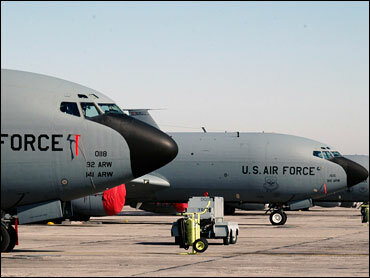 The KC-135 was so severely damaged it could no longer be used, he said. "The threat from the various extremist and terrorist organizations that seek to impose religious fanaticism in the region has not yet been removed," said Social Democrat leader Bakyt Beshimov. "Guided solely by Kyrgyzstan's national interests, we believe the decision to withdraw the U.S. air base is premature," he said. Washington has already received permission from Russia and Kazakhstan to transport non-lethal supplies for Afghanistan by rail. It hopes to secure similar guarantees from Uzbekistan, which has a border and transportation links with Afghanistan. Around 100 containers of non-lethal supplies bound for Afghanistan left by train Wednesday from Latvia for Russia, U.S. diplomats said. Also Thursday, a delegation of U.S. military transportation officials arrived in another former Soviet state in the region, Tajikistan, which shares an 810-mile border with Afghanistan. The officials will study Tajikistan's transportation infrastructure and evaluate the potential for shipping nonmilitary cargo through the country to Afghanistan, the Tajik Foreign Ministry said.